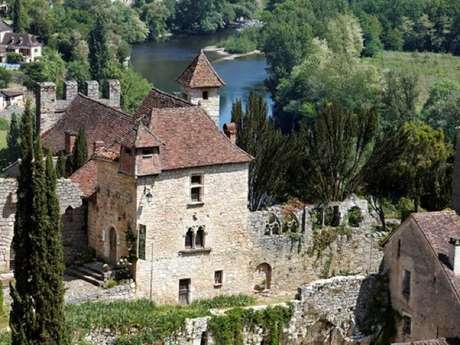 Going eastwards from Cahors, a cliff-lined road winds upriver through the Lot valley to bring you to Saint Cirq Lapopie. This medieval village, elected the Favourite Village of the French in 2012 by TV viewers, emerges from the rock 100 metres above the river. It winds downhill in a veritable cascade of little paved lanes, Gothic façades, fortified gates and hollyhocks. 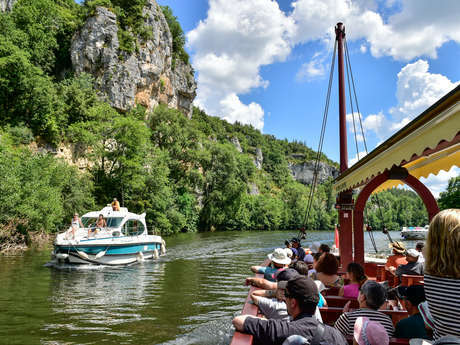 Once host to a prosperous river trade, and renowned for its wood-turners, Saint Cirq Lapopie is a listed site which possesses 13 listed Historic Monuments. The village has not only conserved its heritage, but also retained an irresistible charm. Shops, restaurants and cafés shelter from the sun in the shade of Gothic arches, and the place forms a harmonious whole which won it the election for the Favourite Village of the French in 2012 ! As of the late 19th/early 20th C., the village attracted artists, Parisian art-gallery owners and, from 1950 on, numerous artists belonging to the Surrealist Movement. This artistic dimension is still clearly perceptible as you explore the "parcours d’art contemporain" (contemporary art trail), not to mention the International Artists' Residence set up in the Maisons Daura. It was the poet and writer André Breton who put Saint Cirq Lapopie on the map in a big way. He said of this village where he bought a house in which he spent a lot of time : "Here, I've ceased wishing myself elsewhere". You can easily see why !